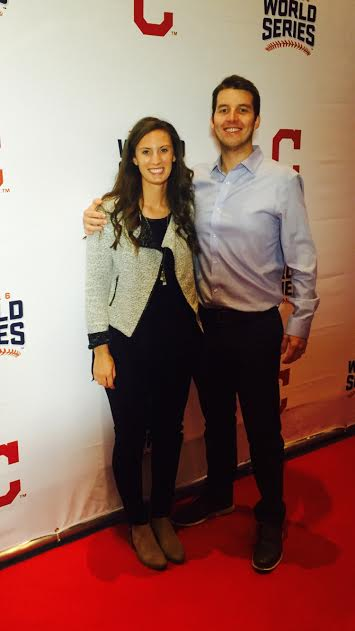 JoHanna Manningham Forman and her husband, Matt Forman, at the World Series as part of their jobs with the Cleveland Indians. JoHanna Manningham Forman, a Penn High School graduate, was in the stands for every game of the World Series thanks to her job with the Cleveland Indians. Forman, whose mother, Bonnie Manningham, teaches English at Penn, is a Corporate Partnerships Service Representative with the Indians. The Indians have four divisions of sales products that they are able to offer to fans. These include Corporate Partnerships, Premium Seating, Season Tickets, and Group tickets. She was a CP Service Rep, and she worked with approximately 80 clients to ensure that their marketing initiatives ran effectively. An average fan may not notice all the advertisements in the ballpark, but these include outfield wall signs, scoreboard features, ‘LBar digital displays on concourse televisions, LED messaging around the stadium, radio advertising, among other opportunities. A Notre Dame graduate, she worked directly with Indians’ clients to update creative advertising, supply reporting for their asset’s performance, and help with hosted events that they may use as a part of the partnership. As a member of the Indians’ front office, Forman attended all seven games of the World Series and also the ALCS games. Her husband, Matt Forman, is an assistant general manager of the Indians. “Going to playoff baseball games is a very surreal experience, the atmosphere in the crowd is much greater than a typical baseball game,” said Forman, who played tennis at Penn and Notre Dame. A 2010 graduate of Penn, Forman said she gained insights into how much effort the players put in to get where they were. She also talked about the vibe of Cleveland how it was good to see everyone wearing Indians gear and supporting the team and rallying together. If you are interested in a job in Major League sports, Forman said just be passionate about what you are doing, and it requires a lot of the same skills as any other job you just have to put in a lot of hours of dedication and make sure you enjoy it.